Massachusetts Senate race: Is Gabriel Gomez the next Scott Brown? 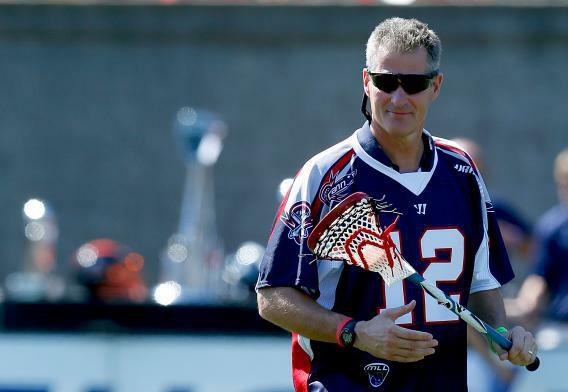 Former Sen. Scott Brown (R-MA) practices throwing out the ceremonial first shot before the Major League Lacrosse Championship Game on August 26, 2012 in Boston, Massachusetts. Gabriel Gomez is, as the AP reported in its news blast last night, the “businessman and former Navy SEAL” who won the GOP’s nomination for Massachusetts’ special Senate election. Gomez is young, too, and unencumbered by experience, excepting only his work for a lackluster 2012 PAC that went after Barack Obama for exploiting the killing of OBL, and his odd request that Gov. Deval Patrick appoint him to the seat when it first came open. More importantly—Gomez is the next Scott Brown! So speaketh Bill Kristol; so speaketh National Journal; so speaketh everyone who notes that Gomez has bascially retained the key team that elected Brown then worked for Mitt Romney. The current polling gives the Democratic nominee an 18-point lead over Gomez, but something something Scott Brown! He overcame a 30-point Democratic lead, didn’t he? MARTHA MACCALLUM: You know, you’ve been called the next Scott Brown. Do you like that title? JEFF PERRY: Well, it surely fits for me. Republicans in the state are both anxious about the economy and emboldened by [California Sen. Barbara] Boxer’s new vulnerability. A Tea Party could get under way, and either [Chuck DeVore] or a freshly combative [Carly] Fiorina could come across as the next Scott Brown. To fellow jaded New Yorkers who think they’ve heard it all, I humbly offer this: Rick Lazio is the new Scott Brown. In this comparison, Harris casts himself as Scott Brown, “the person who has been toiling in the state senate for years, deep in the minority, trying to advance the fiscal conservative principles. With the race tightening and a clear, if under-the-radar, path to victory, regular-guy Stephen Lynch may be poised for a Scott Brown moment of his own. Lynch, of course, was the Democratic primary candidate whom Markey turfed by 14 points. They were the same 14 points predicted by Public Policy Polling. Of the candidates mentioned above, only Harris won—in a general election, in a GOP year, in a district drawn to elect a Republican. Can he win? Hey, anybody can win anything. Democrats absolutely preferred facing one of the bland candidates to facing Gomez. But enough with the “next Scott Brown” and “next Martha Coakley” stuff. It led good men to mistakenly foresee an Elizabeth Warren loss in 2012. Scott Brown himself was only Scott Brown for one shining moment.